Not usually as "productive" as the other scenarios, but are great in at least one other way....maybe world class scenery, or extremely fun, for example. 125. While trolling for chums/coho/pinks Dale has landed kings to 60 lbs. on this river 45 minutes from Sumas Washington (BC's Harrison River.) Most weekends there a 35-40 lb. king takes our lure. We release all fish here. 126. Likely our most aesthetically pleasing fishery! A gorgeous river float with no one around, fly-fishing in gin-clear water. All Upper Pitt River trout (bull/rainbow/cutthroat) Dale and his brother caught were 15" to 5 lbs.! 127. Probably your best shot in continental US at a Killer Whale sighting while always hooking 24+ salmon for our boat per weekend (which is what we’ve done w/our system.) 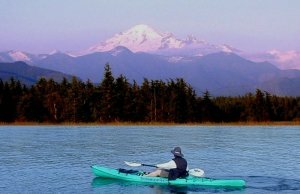 Plus we often see porpoises and two mountains (Rainer and Baker) that are higher than almost any mountain in Montana, and we see the Olympic mountains and we cruise in some of the most scenic islands in America, all in one day! Pile/Eagle Points on San Juan Island, only August 24 to September 4, only on odd-numbered years. Ninety-five percent are fresh pinks, five percent are coho. 128. Earn $180/weekend for your boat, helping save salmon smolts, by fishing the peak of Northern Pikeminnow Reward Program (Columbia River.) Where else do you get paid to fish with a rod! 129. Willamette Falls in NW Oregon is so scenic that, like Niagara Falls, it has commercial boat tours to it. Dale’s boat has had 200 shad/weekend. Also, one of the more popular Chinook rivers in the NW. 130. We believe the best challenging, stream fly-fishing for good-sized selective trout in the continental US is a guided Missouri River trip, in W. Montana…one day's drive from Seattle. Dale's uncle likes this spot.